8% An instant later she is flying at a wall. She recognises a print from the Dogs Playing Poker series by Coolidge, supposedly ubiquitous, but she realises this is the first time she has actually ever seen one, and then she hits. Hunter’s house is of distressingly solid construction. In a more modern dwelling this might cave in a plasterboard wall but not here. She slides down the wall and lands badly, and a huge shape, comically thuggish, blocks her view of the room. I kind of like the writing stle, Sarah. 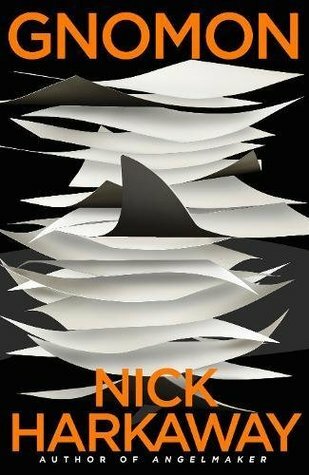 Is that a shark’s fin on the cover? This one does sound pretty scary…and a bit creepy. Enjoy! Thanks for sharing, and for visiting my blog. I do wonder how she got into the air in the first place. Thrown, I assume. Sounds good! I hope you enjoy it. Thank you, Yvonne – I’ve now read a bit further and become accustomed to the writing style, so am now enjoying it. Yes – I managed to read another chunk of it last night and I’m now properly into it. It’s a book of ideas as much as a story and now I’ve relaxed into the reading style, I’m thoroughly enjoying it. Great teaser! I’m wondering why she was thrown against a wall. Hope you enjoy it. Thanks for stopping by my blog! You’re welcome:). I’m now really getting into this one and enjoying it. I like wordy and descriptive writing, but I just don’t think I can even begin to get my head around this one, let alone cope with over 700 pages of it! Nick has however, selected some intriguing and interesting cover designs, which I enjoyed browsing. As you have enjoyed previous books by this author, I’m guessing that you just need a few more pages to get into the story and then you’ll be fine. You’re right, Yvonne:) I have now managed to get into this one and am enjoying it. It’s more a novel of ideas than a straight story – but that’s okay. Sounds like a tough but worth it read. I like the teaser.